Ireland's Valeo Foods has launched a range of cooking pastes in its domestic market under its Erin brand. Aimed at encouraging customers to cook at home, each Dine-Ins kit contains two pots: one with a flavoured concentrate paste with oil and stock and the second with ground herbs and spices. There are four flavours in the range - Thai Green Curry, Tikka Masala, Sweet & Sour and Chicken Korma. 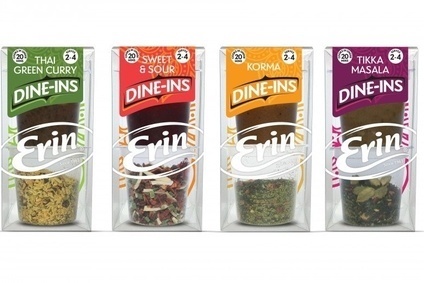 The Dine-Ins range launches next month and is priced at EUR2.99 (US$1.28).